But hey, we didn't go alone. We planned this trip with my husband's office friends along with their family (we all have become good friends now). So basically, we were excited to explore Seychelles together. Mahé is the main island in Seychelles & also the most developed. We booked our stay for 3 days in this beautiful tropical paradise. There is no better way to venture around the island of Mahé than by car. And cars in Seychelles are usually small and that's what we recommend too. You need fantastic driving skills, brilliant confidence and a lot of courage to drive in Seychelles as the mountain roads are narrow and steep. And driving in Seychelles is on the left side of the road. The roads on Mahé are low-traffic, mountainous, narrow roads, so caution is generally advised. The roads usually have steep drops or low walls on the side instead of curbs, which can make driving on the narrow roads stressful, especially if driving a large vehicle. On 21st April 2017, our 1st day started with rent a car for 3 days at Seychelles Airport to drive around the Mahé island. And we already booked a resort named Berjaya Beau Vallon Bay Resort & Casino in Beau Vallon (the most popular beach on Mahé). Situated on the northern coast of the island, it is very popular among tourists. It's one of the most beautiful white sand beaches I have ever seen in my life. It took around 15-20 minutes to reach our resort where upon arrival we got to know that we can't check in at that moment as the check-in time was 2 pm and we reached around 10 am. But they provided us a complimentary buffet and kept our baggage safe in a room. There were a lot of veg options on their buffet and we really enjoyed the food as we were already hungry. We then went to explore the resort and found a wonderful outdoor pool where we planned to spend our time. It was fun swimming and sunbathing there. The resort also features some good restaurants, bars, a tennis court, casino & many other facilities. After spending a quality time at the pool, we finally got our room keys. We quickly checked in and went to have lunch in one of the restaurants named Pizzeria in our resort. The Italian cuisine at Pizzeria was really good. As our resort was located at the lovely Beau Vallon beach on Mahé Island, we simply walked down the beach and it was so damn beautiful. It was a magnificent white sand beach with the crystal clear turquoise water. On a clear day, you can see at least four shades of blue in the water, and when you walk closer on the soft white sand, you can see the base of the sea. After spending few hours on the beach, we enjoyed the amazing sunset. The best beach moment for me on that day was watching the gorgeous sunset. Then we went for a drive to Eden Island, a few kilometers from the main town of Victoria where we explored the Island and the Eden Plaza. We bought some fruits, juices and other snacks from the Supermarket in Eden Plaza. We had fun roaming there. Then we drove back to our resort at night. We started our 2nd day with a mesmerizing view of the sunrise on the beach. We walked along the beach, enjoying the cool breeze & the sound of the waves on the sand. It was so peaceful and relaxing. After having breakfast in resort's buffet restaurant, we got ready for our next day trip to explore the Island. We booked a private boat for the day to Anse Major beach. Anse Major is a very renowned beach on the North West side of Mahé. We still had 2-3 hours to start our boat trip. 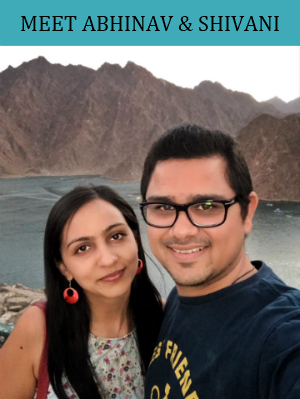 So meanwhile, we drove to nearby places and stopped by a beautiful view along the trail that was breath-taking with glistening crystal blue waters, lush tropical green mountains and sloping granite boulders worn with time. We took a few snaps there standing on the rocks. Anse Major beach is a large sandy beach with two sides separated by large granite rocks. Behind the beach is a small lagoon. The beach itself was fantastic. And it was only our group on that deserted paradise island beach. We snorkeled in the clear turquoise waters over and around granite rocks. The abundance of sea life was fascinating through the lens of a snorkel mask. Our picnic ended in the evening. We got into our boat and again enjoyed our ride back to the resort. Didn't have much to do after that because we all were tired throughout the day. We had dinner with some gossips, and then we went to sleep. Now it was our last day in Seychelles and we were already missing it. Our 3rd day also started with a beautiful sunrise on the beach. Then we went to drive on the roads of the Island where we stopped by another beach, Anse Carana. The beach was calm and beautiful with the rocks along the coastline. After enjoying the early morning weather on Anse Carana beach, we went back to the resort. Then we planned to cover the whole Mahé island route by Car. We opened our map and started off from Beau Vallon. The west coast of Mahé island gets narrow here. This side of the island is quieter and wilder, with beaches backed with green jungle-covered hills. There was a tortoise farm on our way where we saw giant Seychelles tortoises. Really giant tortoises. The island is divided into east and west by the Morne Seychellois National Park, a mountain range with peaks as high as 905 m clad in a thick tropical forest. The majority of people live on the east coast, particularly between the airport and Victoria city. From Beau Vallon, we started heading to the west coast road, where it is possible to hike to the gorgeous Anse Major. Well, driving in Morne Seychellois National Park was an amazing experience with the splendid views of the island. It is a great place to hike for those who can't just sit on the beach. 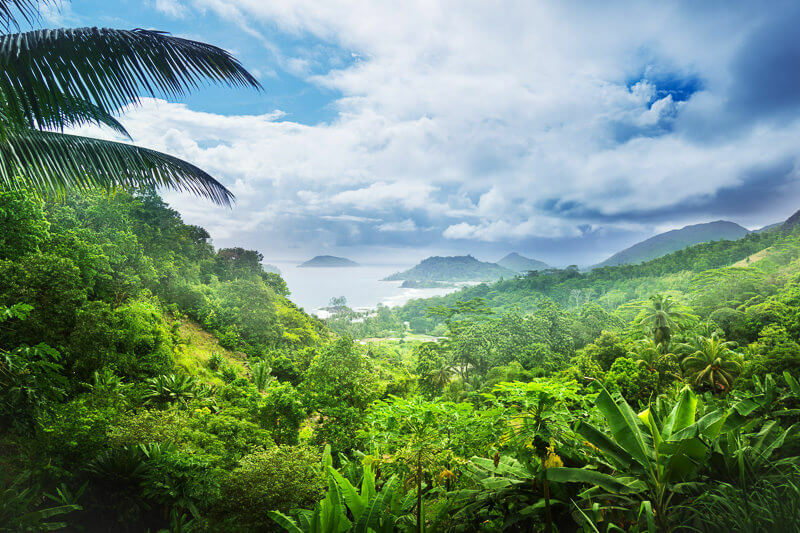 The splendid Morne Seychellois National Park encompasses an impressive 20% of the land area of Mahé and contains a wide variety of habitats, from coastal mangrove forests up to the country's highest peak, the Morne Seychellois (905m). We drove through dense forest and every now & then, there was a nice view over a valley or the sea. We drove down the mountain to Port Glaud and the Anse Boileau (bay) via a narrow road that rises high above the water. The beach was picture perfect there, with white sand and crystal clear blue water. The road passed a number of small but beautiful beaches with great views that made us stopping by for a walk on those beaches and taking some quick photos. From Anse Louis in the southwest around to Anse Royal in the southeast is an area of outstanding natural beauty, with great coastal roads, hidden coves, and delightful beaches to discover. The east coast of Mahé is the most built-up part of the island. After passing through the Airport there came Eden island, which is located just off Mahé and is home to a finite number of luxurious villas, sophisticated Maisons and stylish apartments. After crossing the Eden island, we reached Victoria, the capital city of Seychelles. We wanted to take a walk around some of Victoria's sights but the market was closed on Sunday. 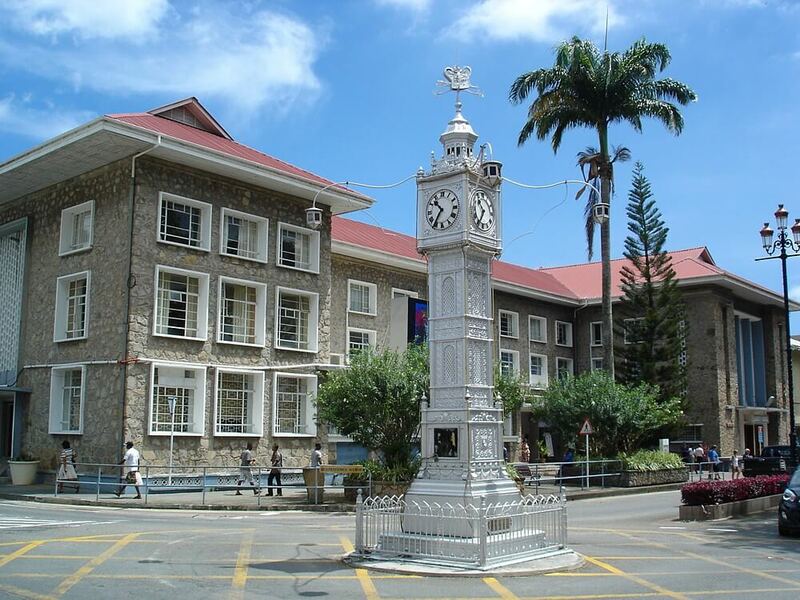 Attractions in the Victoria city include a Clock Tower, a replica of Vauxhall Clock Tower in London, England, the Courthouse. There's also a cathedral, Natural History Museum, colorful Hindu temple and Botanical Gardens with spice grove and mini rain-forest. From Victoria a road rises over the hills to the west, taking travelers to the beach resort of Beau Vallon, a huge sweeping bay with calm shallow waters. We were now back to Beau Vallon, from where we started. With around 20 beaches, plus viewpoints, and shopping marts along the way, we enjoyed our road trip. At night, we all sat together for dinner at the Indian restaurant in our resort and had fun. Our flight from Seychelles to Dubai was at 8 am. So, we packed our bags before sleeping and slept for only 2-3 hours. Early morning, at around 4 am, we checked-out and drove back to the Airport where we returned the Car too. Since we didn't buy souvenirs yet, we explored the shops in the Mahé Airport where we bought souvenirs not only to remind us of the place visited but to remind us of the people we connected with and the precious moments we collected in Seychelles. Have you ever been to Seychelles? Share your experience in the comments below! I really enjoy your posts! They’re always insightful and full of valuable content. I started traveling last summer, and I’m not sure how it took this long… but I recently found your blog, and I’m loving the content. Thanks for reading! I hope it will help you in your future trips. Good luck for your next trip!